Standing on the deck of the SS Doncaster, Holmes and I watched silently as the burly chaps from the rescue boats hooked up the wreck of the Mangochutney and began to haul their listing cargo towards the French coast. “Well,” said I. “Suppose that puts paid to Phogg’s round-the-world trip, eh?” After our recent escapade, Phogg and his Parisian companion had retired to their cabin with my wife for a few hands of poker before bed. “Indeed.” Holmes checked his pocket watch, nodded to himself, then pulled out a small apparatus from his waistcoat, extended it several inches and held it to his eye. 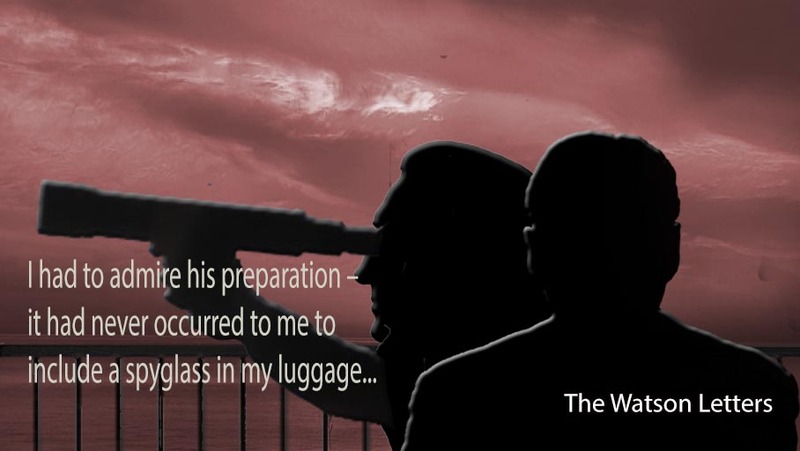 I had to admire his preparation – it had never occurred to me to include a spyglass in my luggage, let alone my waistcoat pocket. As I made my way to my cabin, an unhappy sinking feeling began to make itself known in my lower decks. Whatever was about to happen, I knew Moriarty and co would not take any chances this time – when the attack came, we would all be fighting for our lives. The intrigue continues, Colin. A great episode. Thanks Robbie – who knows what’ll happen next?